Easy Indian Tomato Chutney is one of many chutneys that is served alongside an Indian meal. Taking just minutes to make, Indian spices transform fresh tomatoes into a rich and flavorful dish. I am always surprised each time I cook with Indian spices. Depending on what combination of spices used, there are so many flavor profiles that can be achieved. This simple tomato chutney is naturally sweet from the tomatoes and so full of flavor. How do I serve this tomato chutney? There are so many options when it comes to serving this chutney. You can serve it alongside any Indian meal as a condiment, use it to dip sweet potato samosas, serve over basmati rice for an easy to vegetarian meal or as an appetizer with warm naan bread. Is this Indian tomato chutney spicy? This recipe is not spicy at all. If you want to make it spicy, you can leave the seeds in the green chili’s or change the mild chili powder to hot chili powder. Where did chutney come from? Chutney is a name given to the condiments and relishes served with Indian cuisine always made from fresh ingredients. The word originates from the Hindi word ‘chatni’. 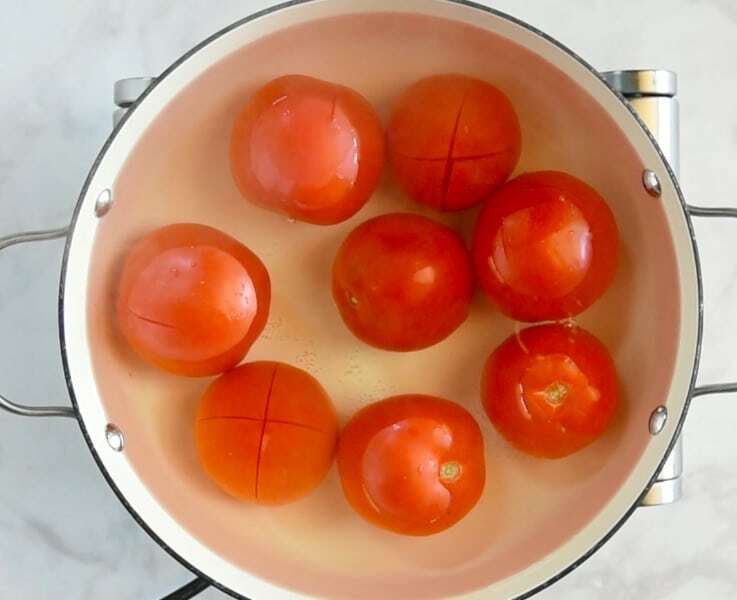 Score the skin of tomatoes with a X.
Simmer the tomatoes for 5 minutes to help loosen the skins. 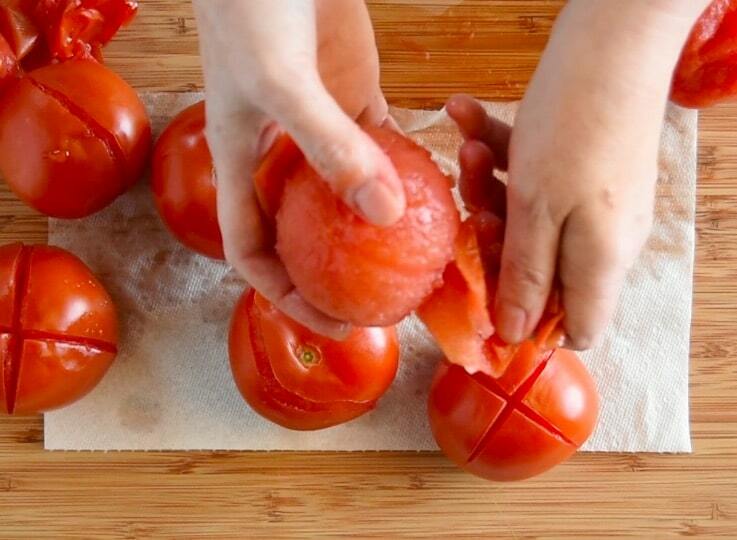 When the tomatoes are cool enough to handle, peel the skins. Heat oil in a pan and add the spices, green chili’s and garlic. Add the tomatoes and bay leaf and simmer for 15 minutes. If you’ve tried this Easy Indian Tomato Chutney or any other recipe on the blog then don’t forget to rate the recipe and let me know how you got on in the comments below. I love to hear from my readers! You can also FOLLOW ME on FACEBOOK, TWITTER, INSTAGRAM and PINTEREST to see daily recipe updates. Taking just minutes to make, Indian spices and transform fresh tomatoes into a rich and flavorful dish. 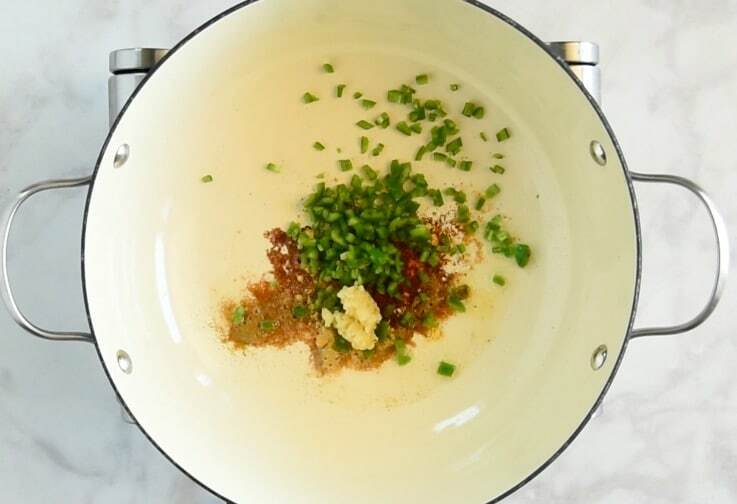 Bring a pan of water to a low simmer. Score an X with a knife on the bottom of the tomatoes. Add the tomatoes to the water and heat on a low simmer for 5 minutes until you see the peel start to remove. Drain the tomatoes and allow to cool until you can handle, then peel the skins. 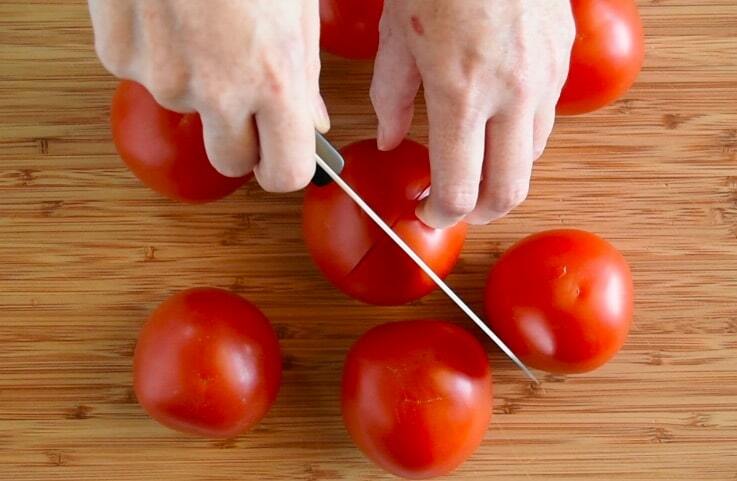 Chop the tomatoes, set aside. To a sauté pan add the oil over medium heat. Add the cumin, mustard powder, turmeric, chili powder, chilis and garlic. Cook for 1 minute. 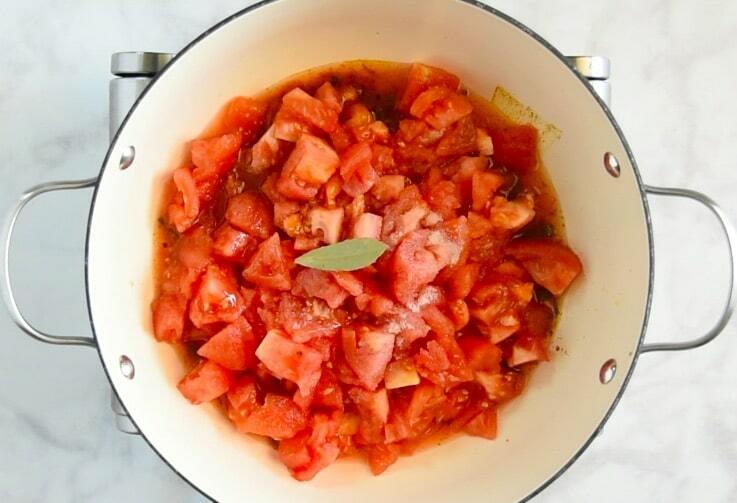 Stir in the tomatoes, salt, sugar and bay leaf. Cover and simmer for 10 minutes. Remove the lid and simmer for 5 more minutes until thickened. Serve garnished with cilantro. The chutney will keep for up to 5 days refrigerated in a sealed container. If you are familiar with the canning method, it will keep longer. Thanks for the question. That Chutney sure does look delish. yum. I often make it too. Thanks for reminding me as it’s been a while I made some. outstanding fresh flavors, this is my kind of dish, and the family will love it too great job on this and the photos! What a great way to use up some of these garden tomatoes. I love chutney! And Indian food in general. Great recipe! I love a chutney, but never tried an Indian one. Janette, this looks delish. I haven’t done much with Indian spices, but you’re combo of spices make this recipe irresistible. What do you think of using basil instead of cilantro. Just not a lover! Yummy! Thank you for giving me some inspiration to experiment with Indian spice. Your chutney looks fantastic! This looks so fresh and colorful and tasty too! YUMM! Love the tomatoes in this recipe. You have a great recipe here. I could eat a whole bowl of this with naan. Looks so good. These look lovely Janette 🙂 Absolutely love your photography too! This looks absolutely divine! I must try it!!!! Awesome idea. I love Indian flavors I’m sure this could be turned into a main course too. The tomato chutney on top of these bites is so perfect, love these!! Wow, this looks good. Pinned it to my APPETIZERS board. I love chutney but it has been years since I’ve had it. This dish is certainly going to be a fave for me.